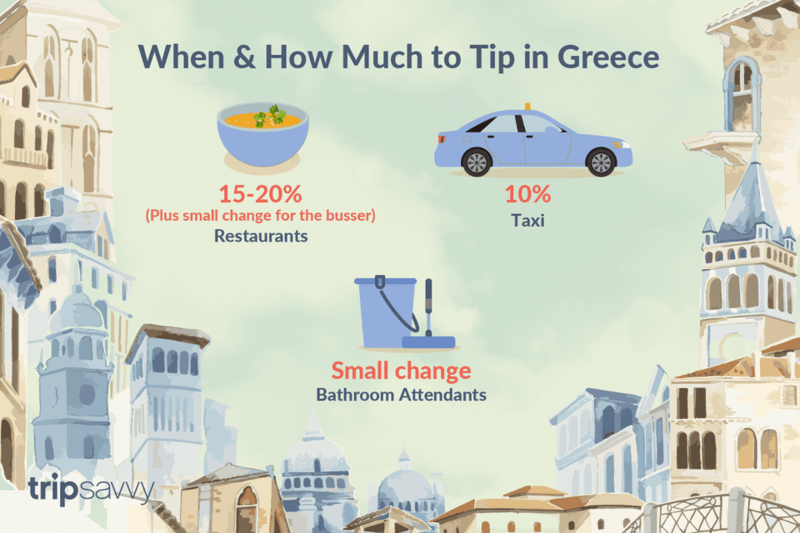 Most tourists find some of Greece's conventions around service and tipping to be a little confusing since they tend to vary from the traditions found in other countries. It is worth taking a little time before you land in Greece to familiarize yourself with the spoken and unspoken rules about gratuities. At most restaurants in Greece, especially those with a large tourist clientele, do not wait for the waiter to bring the bill to you. You will not see the bill until you specifically request it. As with any service you are paying for, check the bill for any obvious errors. In Greece, tips are not required (just as in the U.S. and other countries) but are expected. As in the U.S., you reward a tip based on good service. You should leave a cash tip for the waiter on the same tray containing your bill—roughly 15 to 20 percent of the bill—and a little something on the table for the busser, the person who sets and clears the table. If you are dining with Greek friends, they may be surprised that you leave a tip, but in all but the most traditional places, tips are anticipated. Do not expect your Greek friends to contribute toward the tip. The custom calls for tourists to pay tips, not native Greeks, especially in more remote locations around the country. It is polite to thank the eatery owner for a good meal, particularly in a smaller or family-run place. The "cover charge" on the bill at a restaurant is literally the cost to cover the table when you sit down and includes your bread and non-bottled water. This fee cannot be removed, even if you do not drink the water or eat the bread. It is usually about one Euro per person, and while you may not find it at all restaurants in Greece, if you are subject to a cover charge, it is not worth arguing about it. If you dispute it, you may appear uncouth, which is not a good way to set the tone for your vacation. Taxi drivers serving tourists in Greece expect tips; usually, about 10 percent of the fare is sufficient. If your taxi driver is handling your luggage, there will be an official charge added to your fare. Passengers are also expected to pay for tolls and any road fees. You should remember to give a tip to the person attending the public toilet. Attendants keep the stalls stocked with toilet paper and washrooms refilled with soap and paper towels. Be sure to wash your hands before giving a toilet attendant a gratuity. Do not stress about over or under-tipping while you are a tourist in Greece. As long as you are polite and appreciative, most in the service industry will treat you well. Try to use the tipping guidelines, but do not break out your calculator, since, as in any country, tipping is more of an art than a science.